Curtis Sokes at Curtis Stokes & Associates tells me that he has Balkan I (previously known as Balkan 28) for sale. Balkan I started life as a 27m Cantieri di Pisa in 1982. The yacht was bought by the government of the Republic of Bulgaria for the general Secretary of the Bulgarian Communist Party and the Chairman of the State Council of the Republic of Bulgaria, Todor Zhivkov. After the political changes in 1989, the yacht was carefully kept in a Bulgarian Navy base in a specially built building until 2007, when she was sold by the government to a private company. The present owner moved her to Turkey for a complete overhaul from the keel up. The rebuild of Balkan I has been completed with the hull lengthened, all new machinery, electronics, electrical, audio/visual, interior furnishings and layout and exterior paint. Millions more than her asking price have been invested in her. The seller will consider reasonable owner financing or leasing terms. The yacht is close to Ataturk Airport, so previews are convenient. 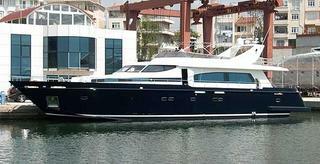 Sleeping eight guests in a master, VIP and two twins, Balkan I is asking €2.95 million.